How to get over your Monday Morning Blues! As a kid, I remember reading Mark Twain’s book, ‘Adventures of Tom Sawyer’. One of the lines in the book read –“Monday morning comes, and Tom is unhappy—as usual—to go to school”. I realised it was not only Tom who got Monday morning blues but, it’s the case with most of us. 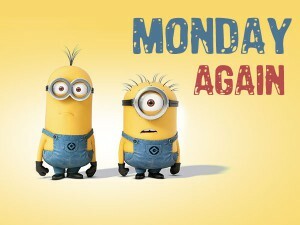 To be honest, nobody likes Mondays, I included. Monday reminds us of the monotonous routine that we need to get back to after a lazy and fun-filled retreat on weekends. It reminds us of our responsibilities, pending tasks and commitments and more often than not about things that we cannot avoid thus triggering the feeling of stress, anxiety and sadness. Is there a way to get over Monday Morning Blues? With a little effort, we sure can! Very often over the weekend, we tend to procrastinate our tasks and pile it up for Monday. Have a few calls to make or prepare a document? “Ah! Will do it on Monday”. But, as Monday nears so does our anxiety regarding the pending work. It’s better to plan in advance and not leave out anything and finish most of the work by Friday evening. As simple as it sounds if we have something more exciting to look forward to, Mondays would become less harrowing. For example, if you bought a few good looking clothes on Sundays then definitely you’d want to show up in them at work the next day, that would give you enough excitement, though, buying new clothes every weekend may not be so economical, we can try other methods too. Like cooking something delicious for our lunch box or thinking about pitching the new business idea to the boss. If you start your week with a cup of your usual coffee and the newspaper then let’s try something different this Monday, how about, staring the day with a lazy cup of green tea and a thrilling fiction in our hand to keep us engrossed. What benefit will that bring? Well, it will take out the monotony of the weekdays, the same monotony that we dread! Instead of planning a tight schedule have a relaxed weekend. Fun can bring down your stress but, it can drain you as well. And when you are tired, the idea of your weekday schedule next morning can distress you more, so relax and rest! This positive note can actually make your day, if only you bring your thoughts to action too. Put on some energetic music that would set you in a dancing mood. Get up to some nice music you usually enjoy and that makes your day. The thumps and rhythms of the music may even send you dancing and at the same time getting you some exercise! So let’s reset our Mondays in style from now on, in style!